If you’ve been around babies before or have friends with babies, then you may have heard of RSV. That’s stands for Respiratory Syncytial Virus. Many parents hear horror stories about RSV, but the reality is that for most children, it is usually a benign illness. RSV is a common respiratory virus that causes a cold-like illness: runny nose, cough, fever, sneezing. For most school-age children and adults, that’s all it does. RSV can also cause pneumonia in young children, which can lead to the same symptoms. The lining of the airways are swollen from edema. That is, they are filled with extra fluid, similar to a pregnant woman’s ankles. This swelling makes the airways smaller. The virus induces a lot of mucus to be formed, which clogs up the airways and can plug up some small airways completely. In some patients, the virus can cause the muscles surrounding the airways to constrict, making them even smaller. With all these changes, it becomes hard for the infants to breathe and they have a nearly constant cough. How Does My Baby Catch RSV? In the US, there is a seasonal dimension to RSV: it wanes in the late spring and summer, and is most prevalent in the fall and winter. 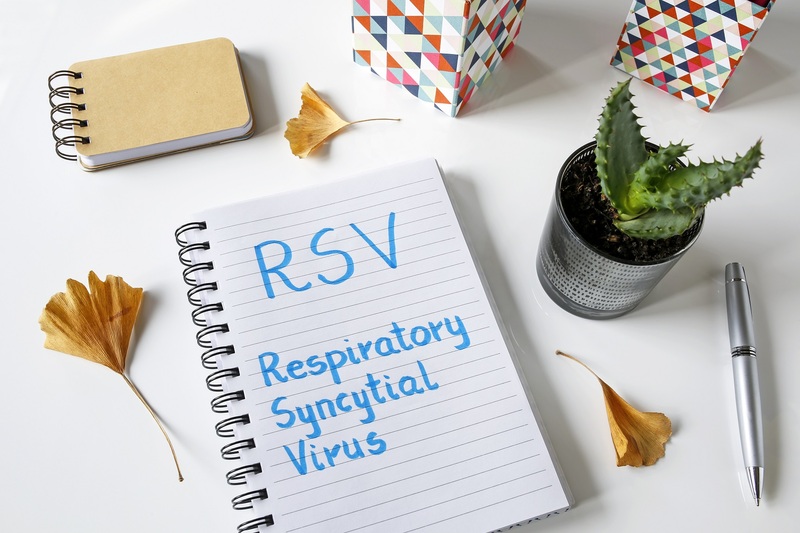 In addition, once you get RSV, you do NOT get lifelong immunity to it, so it is possible to get RSV bronchiolitis more than once, even more than once in a given season. How Do We Treat RSV? Fortunately, most children who get RSV have a mild illness that resolves on its own after 1-2 weeks. For some, hospitalization is necessary because they are feeding poorly, are dehydrated, or having difficulty breathing. Suctioning: most infants with RSV produce a lot of mucus, and getting this mucus out is the mainstay of treatment, even in the hospital. As inpatients, babies have their nose and airways suctioned out frequently by the nursing staff. At home, parents can use similar devices to keep the nose and mouth clear. Oxygen: a pulse oximeter, or pulse ox, is a device that clips painlessly onto a baby’s finger or toe and can measure the amount of oxygen in the blood. If it is too low, the baby will need to admitted to the hospital for supplemental oxygen. Albuterol: for some patients, using albuterol, a common asthma medicine that helps to relax the muscles around the airways and open them up, can be effective. But for most infants with RSV bronchiolitis, albuterol is ineffective. So some doctors and hospitals try to use albuterol at first, and if there is improvement, will continue to administer it. But for most babies with RSV, albuterol is not effective. Supportive care: for many babies with RSV bronchiolitis, eating is difficult, and can even be dangerous, for infants are at increased risk of aspirating food when they are having trouble breathing. So maintaining adequate hydration and nutrition is important, whether at home or in the hospital. Note that treatment does not include antibiotics or steroids. Some infants with RSV bronchiolitis will have a concurrent bacterial infection, such as an ear infection or bacterial pneumonia, and in these cases, antibiotics may be used to treat those other infections. But no antibiotics will treat the RSV. Infants who are 24 months of age or younger at the beginning of RSV season with hemodynamically significant congenital heart disease. But even with palivizumab, infants can get RSV bronchiolitis. However, several RSV vaccines are being tested currently. So How Can I Prevent My Healthy Baby From Getting RSV? The other key is to call your doctor if your child’s cough seems more frequent, she has a lot of mucus from her nose, has difficulty eating, or can’t sleep due to the cough. Also, call if your child has any signs of trouble breathing, such as breathing rapidly, or labored breathing (ribs appear to be poking out with each breath, the notch above the breast bone is sinking in with each breath, the nostrils are flaring with each breath, or the abdomen is see-sawing deeply with each breath). This is especially true if your child is one of those at high risk. Piedimonte G, Perez MK. Respiratory syncytial virus infection and bronchiolitis. Pediatrics Rev 2014 Dec;35(12):519-30. Jartti T, et al. EACCI Task Force on Clinical Practice Recommendations on Preschool Wheeze. Allergy 2018 Oct 1. AstraZeneca. Synagis: High-risk Patient Types.